This French Riviera beach on the Mediterranean Sea can be seen fronting the Promenade des Anglais, a beautiful place to walk, in Old Town of Nice in France. The beaches of the city of Nice on the French Riviera along the Cote d'Azur in Provence, France follows the Baie des Anges for over 7 kilometers. There are many public beaches but, there are also the private beaches which belong to the expensive hotels. The beaches stretch from the Old Town (Vieux Ville) of Nice in Provence, starting at the Vieux-Port, the old port, and continue on to the Nice International Airport. To leisurely walk along the Nice and Baie des Anges waterfront just find the Promenade des Anglais or, if energetic enough, jog or roller blade the whole 7 kilometers. 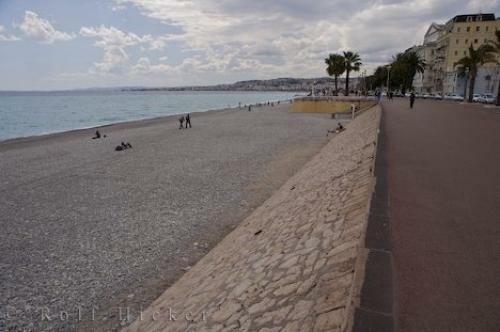 Photo of a popular beach and waterfront walk in Nice along the French Riviera in the Provence, France. Pictures from photo gallery "Nice Pictures"
This picture is part of the photo album "Nice Pictures" - there are more beautiful images waiting for you. ... On the plus side one can become a proficient stone-skipper, and sun-bathe without getting 'gritty'. The people of Nice and tourists both take advantage of the shingle beaches to laze in the hot sun of the Cote d'Azur in Provence, France. Waterfront and beach in the Old Town of Nice, Riviera, Provence, Cote d'Azur, France, Europe. I photographed this photo with the digital SLR camera model Canon EOS-1Ds Mark II, aperture of f/7.1, exposure time of 1/200 sec. on ISO 100, as always I used a original Canon Lens, the focus lenght for this picture was 24mm.